Types of Practice – Move. Run. Sports. A small part of the FA Youth Module 2 takes a look at the types of practice used in football sessions. It also asks a question about saving the more game like practice until the end. Why do we have to wait until the very end of the session to start playing a more match like practice? Well the answer to that after the module 2 course is, we don’t have to wait. We can always start with the game like situation and then go back to a more constant or variable practice. Nothing wrong with seeing what the players do naturally before coaching them to improve, and if that means we have to go back to a more basic practice containing a lot of repetitive then that’s fair enough. Practicing an isolated technique in constant conditions – example, passing over the same distance and angles. Predictable, unopposed or very limited pressure. Narrow focus but a good feeling of success. Massive focus on good technique, lots of touches and repetition of the same movement. Only downside is that not enough movement of directions, lack of angles and realism to the game. But still a good practice to help good technique. Practicing the same technique in variable conditions – example, passing over different distances, angles and heights. More movement is involved which is fairly unpredictable, can be unopposed or part opposed. We have lots of movement and more competitive than a constant practice, but this could become boring and it’s not quite game like. Practicing different techniques or skills in random conditions – example, more than one technique or skill practiced in an unpredictable environment (passing, dribbling, heading, shooting). Very game like, good for long-term learning and decision-making. Multiple outcomes for the players and aids tactical development. In a mixed ability group, the only danger is weaker players getting lost in the practice. So the different types of practices can be put on a continuum which ranges from constant to random with variable in the middle. This gives us as coaches much more freedom to be able to get everything from the different sessions with players of different ages and abilities. This has to make us think that sometimes starting with a more game like practice could be the best way to see exactly where your players are with certain skills in the game. Rather than always starting with a constant repetition and building it up that way. 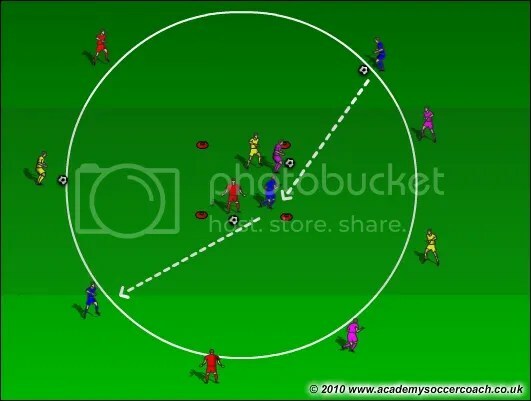 It definitely has made me think about the way I plan my sessions now, why not let them play early on and then go back to it all? Obviously the age of the group and ability must be considered as well when planning sessions!